Taken exactly one week ago. Many people were seated at a grass patch beside Marina Square, waiting to admire the fireworks display later in the night. Great ariel photo. It looks like you were in a helicopter! 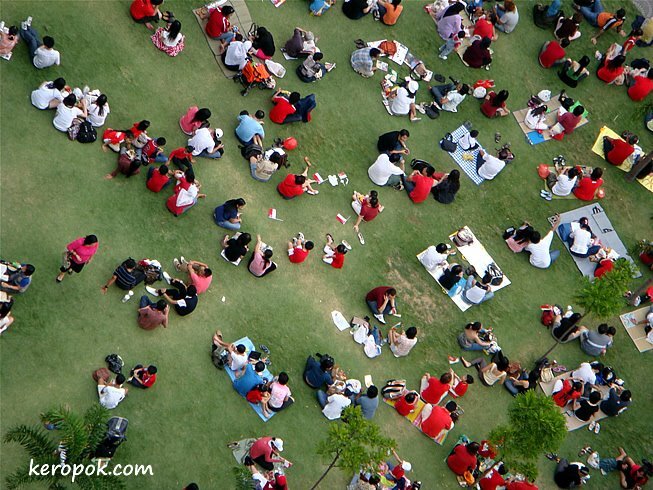 Great top view shot of the crowds Keropok. Next year i might join them and bring some snack & beer. From the looks of the light available, they got there very early. It must have gotten very crowded by the time they shot the first fireworks. Love the aerial shot. Too bad it rained! too bad for these spectators, they didn't have the NDP goodie bag which included a raincoat. yes, it was like a few hours before the whole thing is to start. LOL. Yes, i was the 'bright' one. ya, the rain ruined it for some people. but everyone was happy that day.